Analog drum machines have made a huge comeback. Therefore virtual instruments have come into the forefront to give us all easy access to the classics. Roger Linn’s LM-1 Drum Computer was one of the firsts. 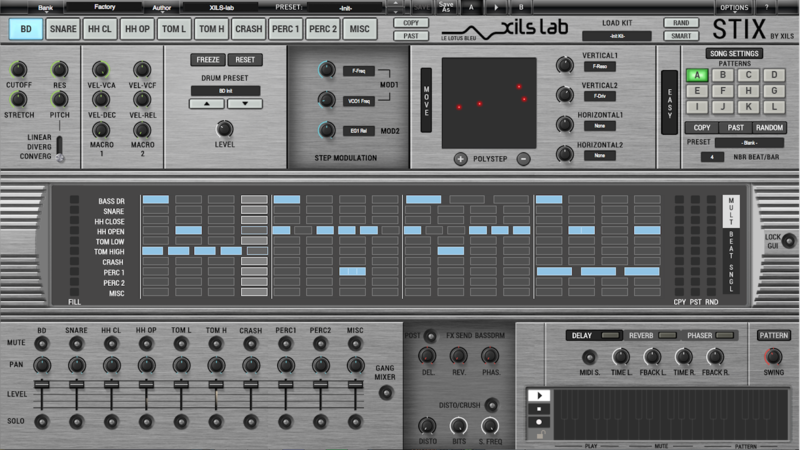 XILS Lab has taken a stab at the hardware with a virtual instrument version. 35 years is a veritable lifetime when it comes to music technology. Today’s computer-based music-makers bombarded by staggering software developments on an almost daily basis may mock at the idea of hefty hardware blazing the trail back in the 1980s. But breakthroughs came throughout that genre-defining decade — often at a prohibitive price. Take the wonderful world of drum machines, for instance. Innovative American designer Roger Linn’s revolutionary Linn LM-1 Drum Computer was first to use digital samples of acoustic drums — albeit at 8-bit/28kHz — and also one of the first fully-programmable drum machines to boot. But back in 1981 most musicians could only dream about accessing a $5,000 USD digital drum machine, revolutionary or otherwise! Only programmability in itself would be a dream come true for many musicians of the time, tied to realistically restrictive constraints when it came to auto-accompaniment budgets. But the technological tide turned in their favour that same year with the timely arrival of the STIX PROGRAMMA ST-305 from (now-long-lost) Italian manufacturer SoundMaster as one of the first affordable analogue drum machines to feature programmable patterns rather than just presets. Proactively, perhaps, the STIX PROGRAMMA ST-305 included individual outputs for several sounds — unlike its main competitor, the breakthrough Boss DR-55, though, similarly, ‘programmability’ was restricted to basic bar-based patterns, which would soon become its downfall. Within a year, Roland’s radical TR-606 Drumatix was a better buy as an affordable analogue drum machine offering a higher number of fully- programmable patterns and, crucially, an ability to chain them together into songs, such was the speed of technological change… before long, the advent of MIDI (Musical Instrument Digital Interface) and affordable digital drum machines changed everything. Endgame? Paradoxically, an ‘analogue renaissance’ is still being felt (and heard) today — a fact far from lost on XILS-lab CEO Xavier Oudin. Obviously, times change as, of course, does technology — music and otherwise. Today, then, StiX by Xils takes the best ideas (and subtly-different, yet strangely contemporary-sounding sounds) from the likes of the STIX PROGRAMMA ST-305 and Roland TR-606 Drumatix — and many more notable drum machines besides — and successfully transports them to a virtual analogue and multi-synthesis drum machine plug-in for Mac and PC, pumped up for a truly 21st Century computer-based music-making experience that is second to none. Central to the StiX by Xils workflow with fast-footed users in mind — and centrally positioned in a GUI that’s as easy on the eye as it is to understand — is its engagingly-expressive XoX Sequencer, boasting a multitude of fanciful features, including a multilane editor with customisable steps per beat; per step division trigger (for fills and stutters); customisable beats per bar; and global swing, as well as a single line editor (for in-depth editing of individual sequencer lines), plus pattern and song modes (for speedy song building). Building upon traditional analogue drum machine design, several sounds — BD (bass drum), SNARE, HH CL (hi-hat closed), HH OP (hi-hat open), TOM L (tom low), TOM H (tom high), and CRASH — are always accessible — alongside additional user-definable PERC 1 (percussion 1), PERC 2 (percussion 2), and MISC (miscellaneous) ones — via the drum pads bar at the top of that intuitive GUI. There the similarity ends, though, as StiX by XIls takes things to another level entirely as an inspired piece of contemporary software design that leaves the historic hardware from which it took its initial inspiration standing (way back in the early-Eighties)! 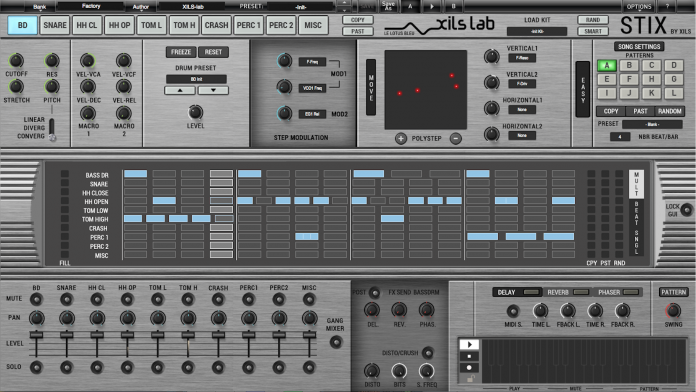 Fit for today, StiX by Xils comes complete with 10 full-featured synthesisers — one for each sound being hosted by those 10 drum pads, each of which can call upon several sound engines, including virtual analogue (with components closely modelled upon a selection of prestigious and rare analogue synthesisers for percussion and drum sounds with unmatched analogue authenticity) and FM sine oscillators (with wave shaping and a third oscillator that can load samples), as well as easy and advanced synthesis pages. Put it this way: yesteryear’s hardware drum machine users couldn’t have imagined such heightened levels of control in their wildest dreams! Desirable StiX by Xils features well worth noting in that regard include MIDI output (for controlling virtual instruments or recording MIDI data within a DAW); MIDI learn (with full automation of all synthesis parameters of each drum pad and associated mixer, etc); multi-criteria database (for finding the right preset efficiently as well as creating custom tags); randomise (drum kits, sequences, and full patterns); live control (for chaining patterns, plus muting/un-muting tracks on the fly); multi outputs (with volume, groups, and pan preservation); high-quality effects (including natural-sounding reverb, analogue delay, and analogue phaser, plus per drum crusher and distortion); sample-accurate synchronisation and audio engine (to create the tightest beats imaginable); hundreds of simultaneous modulation targets; and gang mode (to edit sequencer lanes, mixer, and effects sends). Stacked with 390 exclusive samples — including 15 drum kits sourced by production partner Wave Alchemy from classic drum machines of the past (including Roland’s revered TR- series as well as trailblazing digital dream machines such as the E-mu SP-12 and LinnDrum); 2,000 presets; 120-plus global presets; 720-plus patterns; 700 drum pads; and 60 drum kits, StiX by Xils means more sounds and styles are available to the modern-day discerning (virtual) drum machine user than ever… roll on some truly 21st Century computer-based music-making!